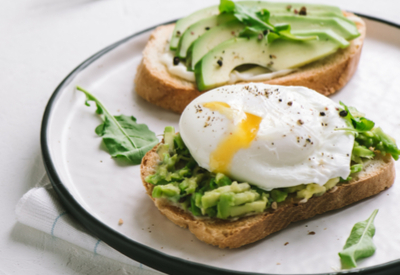 Have you noticed that avocado recipes are all the rage lately? If you take a look at the most current diet plans, eating avocados is most likely to be on the top of the list. Avocados are creamy fruit that grow in warm climates that provide many health benefits. Avocado smash toast with cilantro on top. They are naturally nutrient-dense and contain nearly 20 vitamins and minerals. However, they also contain healthy fats which is important for the body in many ways. Healthy fats help the body absorb many fat-soluble nutrients including vitamin A, D, E and K and various antioxidants. However, there are more benefits to eating avocado smash toast! Avocados have also been linked to improved digestion, heart health and brain function. We can all use that first thing in the morning! But did you also know that this miracle fruit also decreases the risk of depression, osteoporosis, and cancer? So why haven’t we been eating avocados all along? 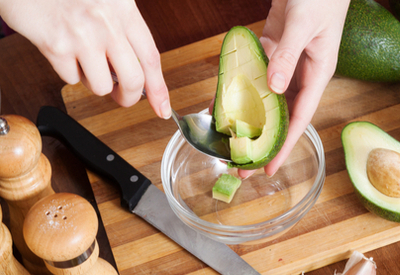 Cut avocados in half and then score the flesh before scooping it into a bowl. The low-fat diet craze decades ago steered everyone away from any fat consumption. This unfortunately included the healthy Omega-3 fats that avocados contain. But now, avocados are back on the healthy list for many nutrition plans. But a word of caution – too much of a good thing really isn’t a good thing! A serving of avocado smash toast includes one piece of toast topped with about 1/4 of the avocado smash. This means that you are eating 1/2 of an entire avocado for breakfast. Just keep this in mind as it is recommended to eat no more than 1 whole avocado per day. That leaves you 1/2 of an avocado for lunch, dinner, or a healthy snack for later consumption. To make it a heartier breakfast add an over easy egg on top! 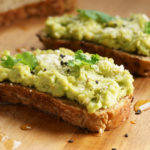 If you are looking to spice things up a bit, feel free to add a little cayenne pepper to your avocado smash toast. Or how about adding a poached, over-easy or even a hard-boiled egg on top? Crisp bacon or cheese are a delicious toppings as well! 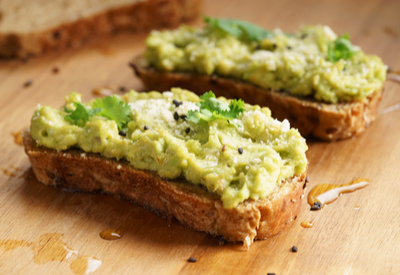 Avocados made into a healthy spread to put on top of toast for a healthy breakfast or snack. In a bowl, smash avocados with lemon juice and garlic, season with salt as desired. Mound on 1/4 of the mixture on a piece of toast and sprinkle with pepper. For additional flavor top your avocado smash toast with an egg, cheese, bacon, mint or cilantro. ← Instant Pot Cajun Chicken – A Recipe With Tons of Flavor!